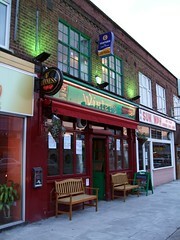 Small, single-room freehouse on Ballards Lane in Finchley. Kake visited on a Tuesday afternoon in March 2009. The two handpumps on the bar offered St Austell Tribute (£2.30/pint) and Greene King IPA. The Tribute was in fine condition, and I had a pint and a half of it. It's clearly a locals' pub; most of the people in seemed to know each other, and there was quite a buzz of conversation going even though it was only 4pm when I arrived. As well as your average male daytime drinker, there was a family group (nan, mum, and toddler), and another chap arrived with a pushchair a little later on. The barman was perfectly pleasant; not only did he remember what I was drinking, he also had a lovely Irish accent. There was no background music. The flatscreen above the bar was showing horse racing with the sound on. The two other screens were showing different things, with the sound off. The decor is traditional but not overly old-fashioned; cream, red, dark wood, mirrors. Accessibility: There's no step to get in, and there's level access to the loos as well, though they're down a narrow corridor and the ladies' at least is very cramped. Last visited by Kake, 10 March 2009. Page last edited 2009-03-12 01:09:10 (version 1).